This library provides implementations of concurrent FIFO queues (for both general boxed and primitive unboxed values) that are fast, perform well under contention, and offer a Chan-like interface. The library may be of limited usefulness outside of x86 architectures where the fetch-and-add instruction is not available. We export several variations of our design; some support additional functionality while others try for lower latency by removing features or making them more restrictive (e.g. in the Unboxed variants). Unagi: a general-purpose near drop-in replacement for Chan. Unagi.Unboxed: like Unagi but specialized for primitive types; this may perform better if a queue grows very large. Unagi.Bounded: a bounded variant with blocking and non-blocking writes, and other functionality where a notion of the queue's capacity is required. Unagi.NoBlocking: lowest latency implementations for when blocking reads aren't required. Unagi.NoBlocking.Unboxed: like Unagi.NoBlocking but for primitive types. Some of these may be deprecated in the future if they are found to provide little performance benefit, or no unique features; you should benchmark and experiment with them for your use cases, and please submit pull requests for additions to the benchmark suite that reflect what you find. 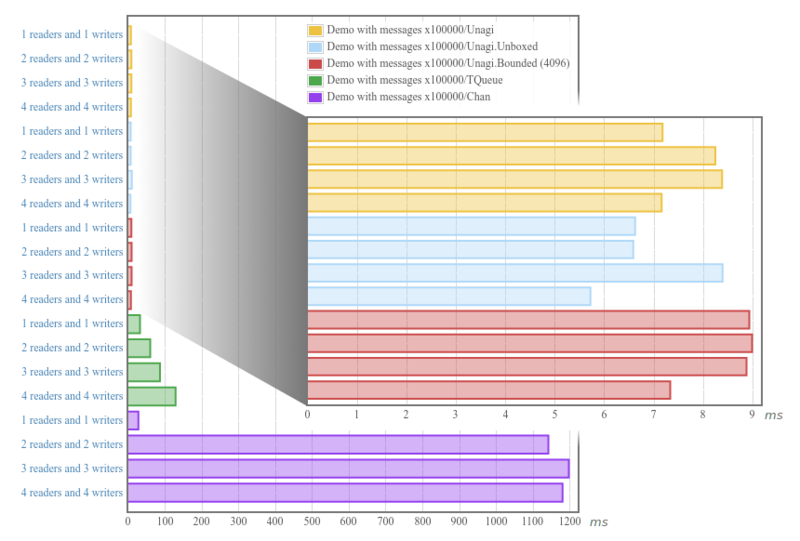 Here is an example benchmark measuring the time taken to concurrently write and read 100,000 messages, with work divided amongst increasing number of readers and writers, comparing against the top-performing queues in the standard libraries. The inset graph shows a zoomed-in view on the implementations here.